1.1. The term Sri in Rig-Veda was used to portray the highly desirable virtues such as radiance, splendor, (divine) beauty, fortune, prosperity, abundance, bliss, happiness, welfare, possession of desired objects etc. Sri, in general (visva-sri), represented all the beautiful and resplendent aspects; happy conditions; and desirable possessions that one aspires for in life. Sri, however, was not, originally, the name of a goddess. 1.2. 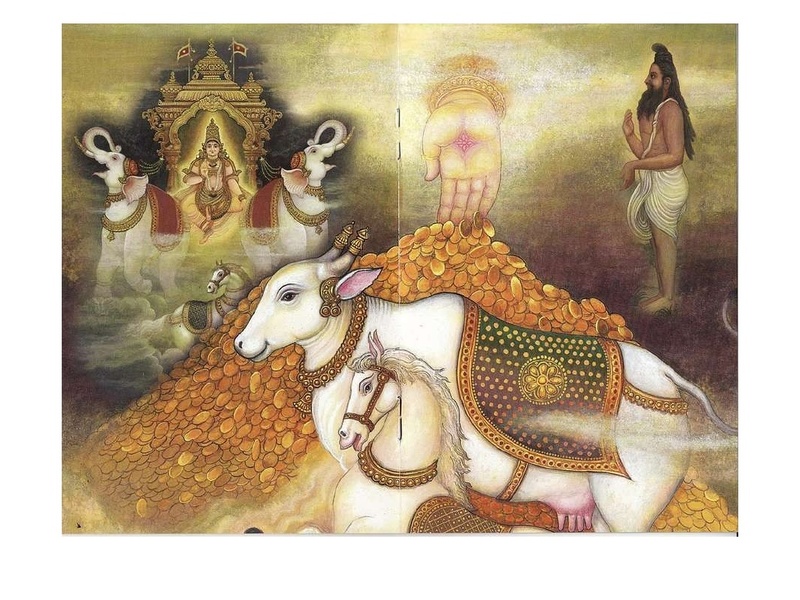 The attribute of Sri was often used to describe the glory and divine qualities of gods such as Agni, Pushan, Indra, Soma, Rudra and the goddess Ushas. For instance; while describing the radiance of Agni, it was said: your glory (sriyo) is like the lightening in rainy-clouds (tava sriyo varsha-asyeva vidyuth: RV.10.91.5). And, again, Agni displaying his glories (sriyamavah:RV: 2.10.1) ‘is the Lord among the gods, having all the glories (sriyo): ayam visva abhi sriyo Agnir-deveshu pratyate (RV: 8.102.9). Rudra is said to have been born as the chief- of – all by the virtue of his Sri (sreshto jatasya Rudra sriyasi: RV: 2.33.3). In Indra, rests all the glories (yasmin visva adhi sriyah: RV: 8.92.20). And, as regards the splendor and radiance of Ushas the goddess of dawn, it was said ‘the radiant Ushas has risen up ushering in glory and brightness (ud u sriya Ushaso rochamana: RV: 6.64.1). 2.1. Sri as the goddess perhaps first appears in Satapatha Brahmana (SB: 11.4.3.1-8; 2.6.3.2). Here, Sri is described the as resplendent (dipayamana) and shimmering (bhrajamana) goddess; daughter of Prajapathi. And, she was assigned a position of eminence among goddesses. The other gods take from Sri and gift back to her various powers and virtues, such as: anna (Agni); rajya (Soma); samrajya (Varuna), kshatra (Mitra); bala (Indra); brahmavarchas (Brihaspathi); rastra (Savitr);bhaga (Pushan), pusti (Sarasvathi); and, rupa (Tvasta). Since then, the presence of Sri and her activities manifest in these spheres of beauty, prosperity, virtue and power. 2.2. And, Sri, as a goddess, is mentioned more regularly, thereafter, in Vedic texts; and is identified with earth, abundance of food, cattle- wealth, Viraj*, Soma and the gods. [*Viraj as a female principle is closer to Sri than others (srir vai virat). Viraj is the wife of Purusha; so too is Sri. In the later mythologies when Purusha – Prajapati – Narayana all merge into Vishnu, Sri is the consort of Vishnu (Vishnu patni).The term Vishnu patni was earlier used for Srinivali and Aditi. 3.1. However, Sri and Lakshmi are treated separate (not as one) in the Brahmanas. 3.2. The phrase ‘bhadra – lakshmi’ appears in the tenth mandala of Rig-Veda, to mean an auspicious imprint (nihita) upon the speech (Vac) of the wise (bhadraisham lakshmir-nihita-adhi vachi: RV: 10.71.2). 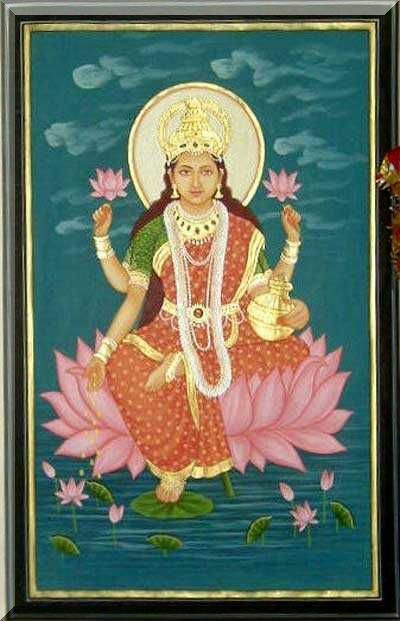 But, Lakshmi is mentioned as a personified auspicious (punya) goddess in Atharva Veda (7,115) who drives away evil spirits (papi) of misfortune and wickedness (a-lakshmi) – puṇyā lakṣmīr yāḥ pāpīs tā anīnaśam ; and ushers in security (fearless-ness-Abhaya) and prosperity (Abhivruddi). Thus, two distinct forms of Lakshmi are mentioned: the auspicious and the foul. 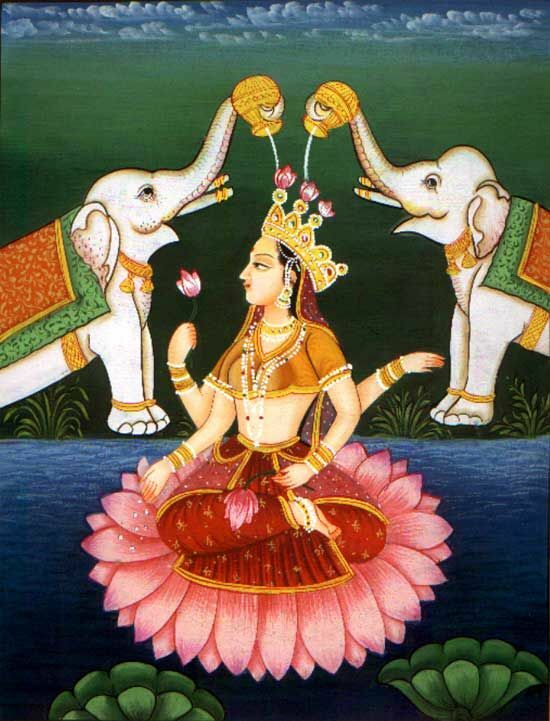 But, over a time the fiendish aspects got erased; and the auspicious aspects gained ascendancy; celebrating the victory of the glorious Lakshmi over evil natures – apa krāmati sūnṛtā vīryaṃ punyā lakṣmīḥ ( AV.12,5.6). 3.3. Sri and Lakshmi appear as distinct goddesses, at the earliest, in Vajasaneyi Samhita of Shukla Yajurveda, where they are called the consorts of Purusha. But, not much is discussed about them. 3.4. In the Upanishads, Sri and Lakshmi who were earlier distinct, become synonyms, tend to merge and finally become one. Their worship together is formalized in the hymn Srisukta, which in fact, is an appendix or supplement (khila) to the fifth mandala of Rig-Veda. The Khila portions of Rig-Veda are considered as addendums or latter inclusions into the Vedic texts, when the gods and goddess tended to become personified. 3.5. Srisukta establishes the identity of Sri and Lakshmi as two names of a single divinity. 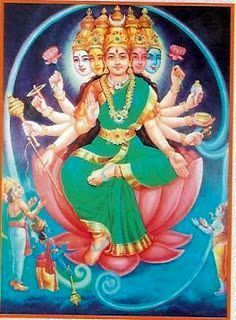 She is the antithesis of Jyeshtha A-lakshmi representing hunger (a-samrddhi), thirst, impurity depravity, and decay (a-bhuti). In this context, there is a mention of the six types of miseries or six waves of disturbances (shad-urmi) that afflict human life. They are: hunger (kshuda); thirst (pipasa); agony of grief (shoka – mano vyadha); delusion (moha); old age or decay (jara); and, death (marana). These miseries are attributed to the evil influence of three types of A-lakshmis. Of these, the first two (hunger and thirst) are caused by Jyeshta, the elder A-Lakshmi. The next two (grief and delusion) are said to be caused by Madhyama, the middle or the second A-Lakshmi. And, the other two miseries (decay and death) are said to be caused by Kanishta the least or the third A-Lakshmi. All these A-Lakshmis hinder life and its progress. The A-lakshmi , in whatever type or form, causing internal (antara) and external (bahya) misery should be driven away . The worshipper , therefore, takes refuge in the protection of the auspicious and gracious goddess Sri. 5.1. As said; Sri is Brahmarupini, and her glory is beyond description. And, yet, for worship-purposes, Sri is represented as a radiant goddess glowing like burnished gold (tapta kanchana sannibha), seated on a white, radiant lotus in full bloom (Amala-kamala-Samsthaa), holding lotus flowers ; and, adorned with rich and sparkling ornaments. 5.3. 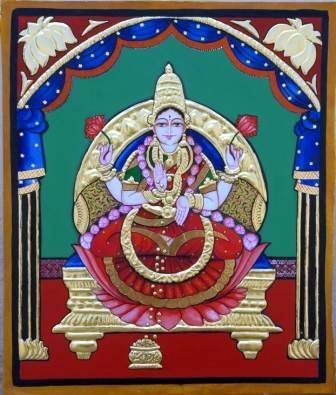 Her bodily form is described as shining brightly (jvalanthi), refulgent (prabhasa) like that of the gold (hiranya-varna), the lotus (padma-varna) or the sun (aditya-varna). She is golden (hiranyayi), decked with lotus – garland (padma-malini) and gold necklaces (hema-malini); and adorned with precious ornaments , made of gold (suvarna-rajatha-srajam). the last (fifteenth) in a prose-like rendering called Prasa-pankthi. And, the rest of the mantras (7th to 14th) are set in Anustub-chhandas (4×8). Let’s briefly, talk about each of the fifteen mantras of Srisukta in the next two parts. The Sri Sukta Commentary and the images you have provided is one of the best commentaries i have read. I have enjoyed each word you have provided on Maha Lakshmi. Do you have any such commentary on PURASHA SUKTA also .. if so .. can you share. Dear Shri Ramaswamy Iyyengar, Thank you very much . I am glad you read this ; and delighted you liked it. Please also read the articles ( three ) I posted on Vaikhanasa Agama . Sorry I have not yet written about Purusha Sukta . I may try on that. Presently I am writing about Upavarsha and will follow up on that by a post on Bodhayana. Dear Shri Iyyengar , By the way ; I have written seperately on Maha-Lakshmi. Dear Shri Ramaswamy Iyyengar , Greetings . Yes; I forgot . sorry.I mentioned in passing about Purusha Sukta while writing about Vishnu -Dwadashanamas . Please also read the other aricles in the series and let me know. Dear Moto , I am glad you read this. You are Welcome. user in his/her mind that how a user can understand it. So that’s why this paragraph is great. science is no different from metaphysics and spirituality. I trust you read some articles posted here. I’ve joined your feed and sit up for in the hunt for extra of your fantastic post. Please do read the other articles in the series; as also the articles on various other subjects. I trust you read some of the articles posted here. Dear Savita Thanks for reading the post closely and for the question. Tradition accepts that Rishi Veda_Vyasa (whoever he was) categorized and compiled four Vedas by splitting the primordial single Veda; and, rendered the Vedas more amenable to study and to memorize. The task of preserving and perpetuating each branch of the Veda, in its entirety and purity , was assigned to a specified Shakha (meaning branch).The followers of each Shakha , identified as Shakins of that particular Vedic school, were responsible for preserving their assigned part of the Veda. Followers of each Shakha would learn and preserve one the four Veda Samhitas along with their associated Brahmana, Aranyaka, Upanishads and the Sutras such as Grhyasutra and Shrautasutra. Of the many Shakhas, only a small number have survived. The prominent among them are Shakala and Bashakala. The present-day Rig-Veda is preserved mainly through Shakala and Bashakala. Considering its great age, the text is amazingly well preserved and uncorrupted. The Shakala version has 1,017 regular hymns (rks), and an appendix of 11 vālakhilya hymns which are customarily included in the eighth Mandala (as 8.49–8.59); thus bringing up a total of 1028 hymns. The Bashakala version too has 1,017 regular hymns (rks); but, has only 8 vālakhilya hymns. The total of hymns, here, in this branch is 1,025 hymns. However, Bashakala version has its own Appendix of 98 hymns. The 98 Mantras in the Appendix to Bashakala were not called as Rks; but, were named as khailika, which meant Addendum. The name was based in the term Khila, meaning a distinct or separate part of the Rig-Veda. The term Khila is the opposite of A-khila. And, A-khila stands for the integral part (Ahila) or the body of the Rig-Veda. Khila is treated separate from A-khila. And, Khilani is the plural form of Khila. The Khilanis of the Rig-Veda were by their very name and nature were later additions, perhaps, written at different points of time. But all Khilanis nevertheless, surely, date back to pre Buddhist times. And, they do belong to the ‘Mantra’ period of the Vedic texts. The hymns in the Khilani are regarded as regular Mantras and have sanctified role in rituals, even from the ancient times. The celebrated Sri Sukta appears as a set of fifteen Mantras in the Khila (supplement) to the Fifth Mandala of Rig-Veda, singing the glory and majesty of Sri .It is placed between the end of the fifth Mandala and the beginning of the sixth Mandala. These inclusions, perhaps, came into the Vedic texts when the gods and goddess tended to get personified. The set of fifteen Mantras (pancha-dasharcha) of the Sri Sukta has its own addendum of twelve (or thirteen) prayer-verses (slokas). In these slokas Sri gets identified with Lakshmi who is described as Vishnu-pathni. The Sri Sukta recited with joy and reverence on all auspicious occasions, has now, customarily , come to be associated Lakshmi the Goddess of beauty , wealth and fortune. thanks for nice blog.every mantra has to chanted specific number of times to get full benefit of mantra how many times sri sukta has to be chanted and when? Dear Shri Prakash, I have no definite idea about this. However , please check http://www.kamakotimandali.com/srividya/srisukta.html. Sir, can you help me with ravati nakshatra mantra or pushan deva mantra, both vedic and beej mantra. I am not sure if I have been of any help. Your reply itself is great help. A most learning teaching commentary on srisukatam. Is this available in book form. A very good commentary. Is this available in book form.